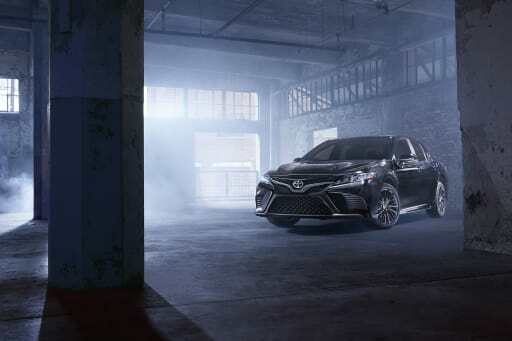 Throwing Nightshade: Toyota to Debut New Camry, Highlander Packages in L.A.
toyota is adding visual flair to both the 2019 camry sedan and 2019 highlander suv with a new nightshade special edition available on each, joining a ubiquitous industry trend. examples of both are slated to be on display at the upcoming 2018 los angeles auto show. for both vehicles, the nightshade special edition — named after a poisonous plant — is an appearance package that is available on the mid-level se trim. in the case of the camry, this adds black 18-inch wheels, a black spoiler and additional blacked-out accents on the outside of the car including the toyota badges. nightshade special edition-equipped 2019 camry ses will be available in three colors: midnight black metallic, celestial silver and super white. for the highlander, the news is much the same. black wheels — 19s in this case — with black lug nuts, a black spoiler and then blacked-out exterior accents such as the shark-fin antenna, door handles and toyota emblems. unlike the camry, the nightshade highlander will be limited to 5,000 vehicles in 2019 and comes available in four colors: the aforementioned black, predawn gray mica, salsa red pearl and blizzard pearl. this isn't the first we've heard of the nightshade special edition, however. at the state fair of texas in october, toyota announced that this package would also be available on another of its suvs, the 4runner. nightshade special edition-equipped camrys and highlanders will start arriving at dealerships in 2019.